Well, some years since we went all in, but all considered the food was good, with plenty of choice, the "Special" alacarte resturant and the El rancheon was POOR though, and we didn't use the other 2 tickets to book we had left, they seemed like they fancied them selves as a snooty michelin stared place, the food was just OK but nothing to want to go again for, better in the buffet! Generally staff look after you well, very friendly, but super friendly IF you leave regular tips, clue there! As do the bar staff, who wants to wait and if its 1 peso, 2 or 3 time a nite so what! Having read mixed reviews about this hotel prior to arrival I was unsure what to expect. Overall we've really enjoyed this hotel. The food was repetitive but of a good quality. Having read up before we went we knew to expect this but some people we spoke to just complain for the sake of complaining, probably because there wasn't any daddies sauce. The daily lunch BBQ was fun, with the live band playing. A La cart was really nice and made a change from the busy restaurant. There's always plenty of fruit and there are themed nights too. The choice of drinks was great, as you'd expect. The room was pleasant, the mini fridge and air con were great. Rooms could have done with a touch of paint but no major complaints. The housekeeping staff did a great job from the maid to the gardner. Rooms are spacious and safety deposit box was free. The location for us was brilliant. 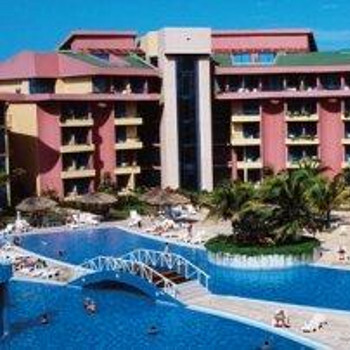 It states that the hotel is some 7km away from Varadero centre. We went into the centre a few times and realised we weren't missing much being so far away. The beach was amazing and the hotel is literally next to the marina and dolphinarium. There is a tourist bus which runs aprox every 30 mins (Cuban time!) from the hotel into the centre and this is 5CUC for a day ticket so you can hop on and off. We found though that some of the tourist coaches offered the best deal as they would stop and offer you a ride to the centre for 2cuc. Taxis are a rip off and even if you try and haggle they still are! We turned many away and just waited for a bus. Most of the staff were really nice and friendly. Some of the entertainment team pestered us a little and the choice of activities was great but also repetitive. I like the idea that all the water sports were included. The staff tried to sell us things quite a lot but a polite no was fine, although there are some good bargains to be had. For us, the only complaint was that on the second to last day the hotel was swamped with 130 French Canadian students who had just graduated. They seemed to take over the whole hotel and their behaviour was inconsiderate and rude. So we left at just the right time. The excursions offered were diverse some were good value for money, others not so good. The sea fari and Havana trip are a must. The hotel offers a money exchange, which we found to be usually a good rate with no commission. I loved this holiday and would definitely stay here again. Hotel was amazing, the beach was outstanding and clean, grounds to the hotel were beautiful and the gardener happily got you fresh coconuts from the trees. This hotel offers basic acommodation with excellent facilities. The rooms were basic 2 beds tv bathroom and fridge. Maid service was excellent however some mornings they were a bit keen to start! Towels were arranged daily into diferent animals and shapes mainly swans decorated eith fresh flowers. The restaraunt choice was excellent there was always something different in the main buffet restraunt for breakfast lunch and dinner. In our opinion the beach side restaraunt was excellent for lunch and dinner. You need to book in advance for dinner. This hotel is set right on the beach and looks exactly like those you see on postcards! the water is warm and snorkaling is a must the watersports are readily availible. The pool is great but it cant compete with the excellent beach. Entertainment is on tap from the moment you wake till the momment you go to bed with everything from "aquagym" to "showtime" language is not a problem as many speak at least 3 if not more. The local market in downtown Varadero is worth a vist and the taxi will cost 10cuc each way. We stayed at the Coralia club playa de Oro from the 16th to 30th May. This trip was our honeymoon and we saved hard for it, so we spent a lot of time reading reviews online before deciding to book. So i know these reviews can make or break a decision! And we're glad we went for it. I think the main thing that needs to be stated in any review is that your review is based on the amount you paid for the holiday - ie, did you get value for money. We feel we got a good deal for this hotel and formed our opinions of it accordingly - had we paid a lot more, we might have felt differently. So - the hotel itself - a huge open air lobby-reception with a wooden roof over it - really unusual looking and a lovely warm breeze in there in the evenings to keep it fresh. The bar here was great (except the pineapple juice which wasnt sweet ...it was gorgeous from the pool bar and in the buffet!? ), the band were on at 7 every night and they were FANTASTIC, can't praise them enough. An exceptionally clean hotel situated on the edge of a beach which looks as though it comes straight from a postcard! The food in the buffet restaurant was always of a very high standard with lots of choice. However the a la carte restaurants offered a limited choice due to the lack of a head chef during the two weeks of our stay. The staff were very friendly and helpful and lanuage isn't a problem as most speak at least 2 languages. Entertainment was provided every night via a cabaret style show put on by the hotel's own 'animations team' who also provide daytime activities for those of a more active disposition. The entertainment was always multi-national courtesey of the young compere who spoke many languages [we counted seven]. We intend to visit this resort and hotel again as we found it to be a very positive experience. We stayed in this hotel in june, we though it was fantastic, it was very clean, the food was good especially the ranch down by the beach, where you could have a barbeque at lunchtimes washed down with some nice wine, then return to the beach again (which is only a minute away) to relax. We found our room to be very clean, we left the maid a $1 tip each day and returned to different designed towels on the bed each day. The hotel has a lovely pool and it was never crowded, you could get snacks there from about 10am-6pm, that was burgers, hotdogs and toasties. The hotel has it's own disco but it was always desserted it was handy though because you could nip in there to get served quickly as the lobby bar that is open 24 hours a day gets really, really buisy in the evenings that was the only downside that I found.